ochre n. an earthy pigment containing ferric oxide, varying in colour from light yellow to brown and red. (Concise Oxford English Dictionary). 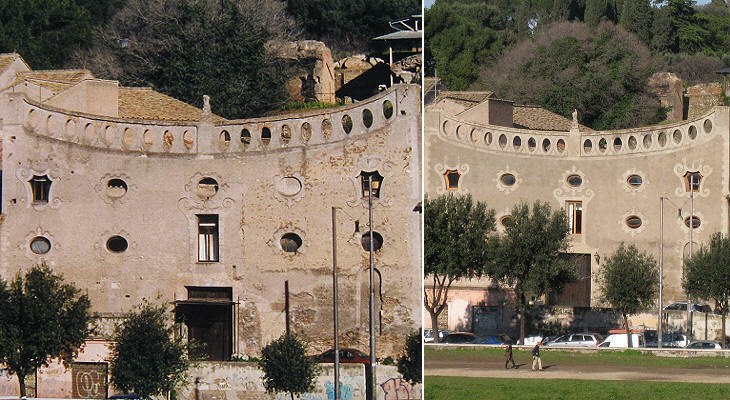 Ochre in its various warm tones characterized the urban landscape of Rome until a few years ago. 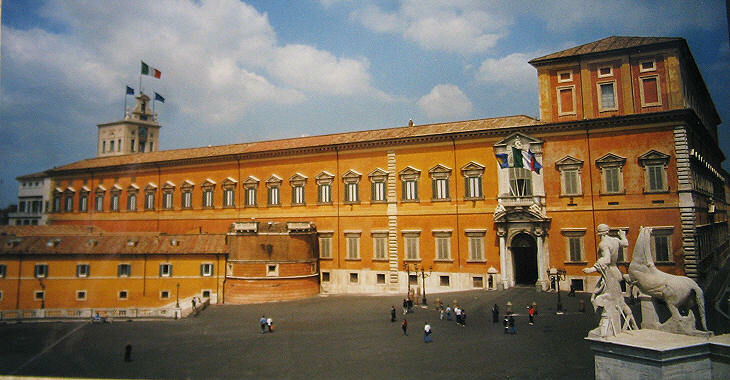 Palazzo del Quirinale, once the residence of the popes and of the kings of Italy, is today that of the President of the Republic. Its façade could be regarded as a symbol of the colour of Rome. This color was continued until the late 1990s when the appropriateness of ochre was questioned. 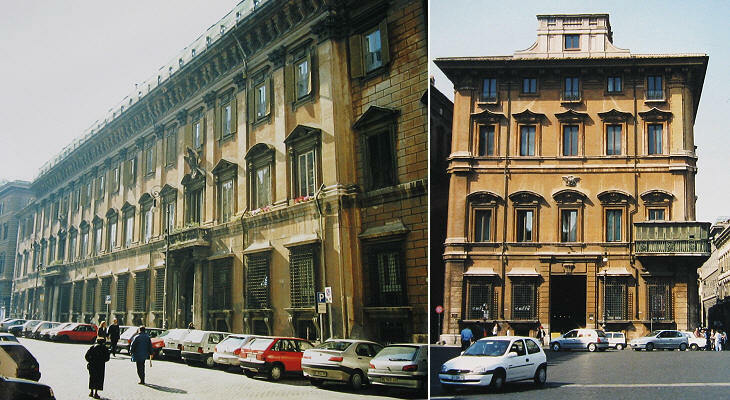 At that time Rome was preparing for the 2000 Jubilee Year and the government funded a program for improving the appearance of the city and for granting tax benefits to private owners who undertook maintenance of their buildings. 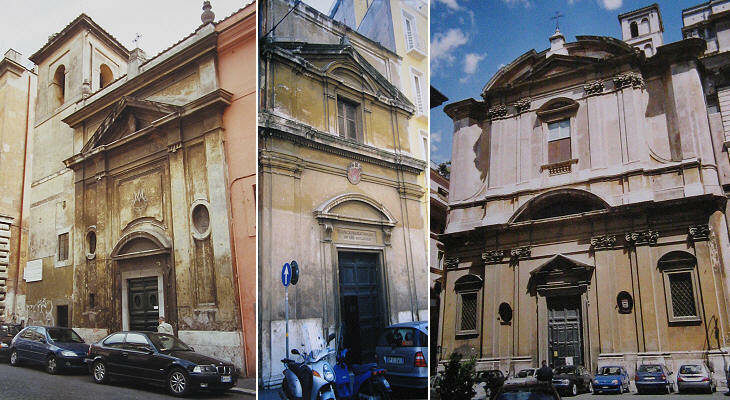 Art historians pointed out that what was regarded as the historical colour of Rome was the result of decisions taken in the XIXth century which were caused by two main factors: a) the relatively dark tones of ochre required less frequent repaints; b) Baroque buildings were regarded as frivolous and bizarre: a uniform and dark colour made their decoration less visible. XVIIIth century paintings showed that the buildings of Rome were painted with lighter colours having a blueish tone: the so-called color dell'aria (colour of the air). Other art historians pointed out that the XVIIIth century colours were not necessarily the original ones because during the XVIth century buildings were painted in dark red in order to imitate the colour of bricks. So the issue is still debated. This web site was started in 1997; many of its images have been replaced by new ones which show the buildings in their new colours; this page (published in March 2009) shows some palaces and churches as they appeared before 2000; the links lead to the page where they are shown after having been repainted. In some cases, such as Palazzo d'Aste, XIXth century colours hid the decorative effect of pillars, frames and lintels. Palazzo Pamphilj at Piazza Navona and Palazzo Patrizi were among the first palaces where blueish colours were adopted. A particular effort was made to improve the appearance of churches; some of them, as those shown above, were in bad need of being repainted. They all have gained from the process, although some art historians complain that their new colours are too bright and that they suit Amalfi or Positano better than the Eternal City. Repainting a historical monument is rarely just a matter of repainting. Very often art historians in charge of supervising the activity discover that in the past the original design was modified and that details were lost: in the bell tower of S. Agnese in Agone the cornice decoration was simplified and the bronze elements of the coat of arms were covered over with paint..
Palazzo Farnese had a uniform grey colour which did not enhance its decorative elements; a careful restoration brought back the lighter and warmer colour of its bricks. 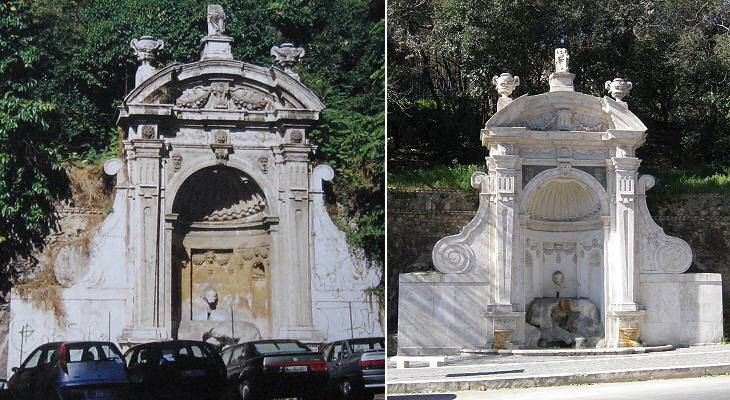 Maintenance of the historical heritage of Rome is a heavy burden; it is not just a matter of cost, but also of having the eyes of the whole world checking on how a restoration is conducted; in Rome there are many outdoor statues (very often close to heaven) which require regular maintenance to ensure they do not crack. Not all Italians agree on the worthiness of such costs; they would like to apply a profit centre approach to historical monuments and to maintain only those which generate sufficient revenue. Unfortunately most of the richest men of the country prefer to pour money into football clubs, rather than sponsoring the restoration of works of art. The level to which cars should be allowed inside the walls of Rome is another matter which is debated. In general residents and shopkeepers are against parking restrictions and pedestrian areas; in the last ten years however their views have been disregarded and now many major (or minor) monuments are no longer hidden by parked cars or darkened by fuel emissions. Large companies have their offices outside the city centre, but in recent years they have felt the need to have a more central location for meetings with key customers or for their public affairs departments. In order to have a prestigious location for these small offices they are prepared to incur the cost of expensive refurbishments. The image portrayed in the background of this page shows a recently repainted bell tower of SS. Trinità dei Monti.